In the Mavericks’ 97-95 win over the Los Angeles Clippers tonight, Mavs point guard J.J. Barea, listed at 6-foot-nothing, 185 pounds, tussled briefly with the Clippers’ Blake Griffin, a hefty 6-foot-10, 251 pounds. 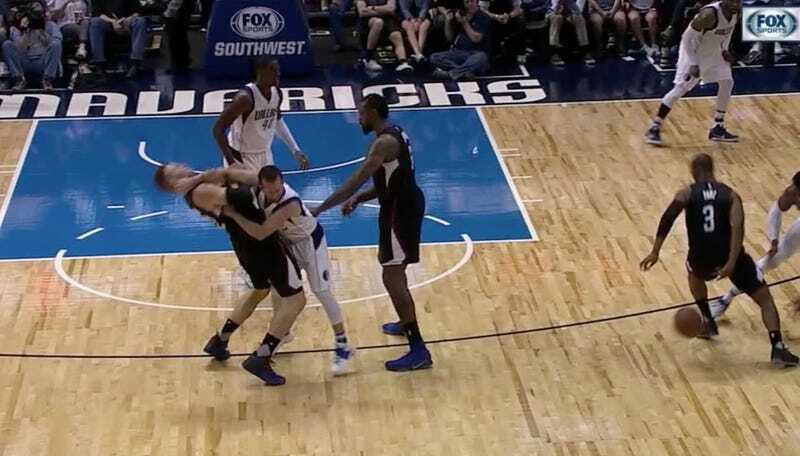 Despite the mismatch, Barea got his hands in Griffin’s face, pushed him to the ground, and was ejected from the game. Everyone looked sort of bemused, especially DeAndre Jordan, who perplexedly swatted Barea away from Griffin as the latter was climbing back to his feet.